Precise weather forecasting is a very complicated process and one has to gain knowledge, skills and expertise to become a master in this field. However, basic information on clouds, their formation and their names will enable you to roughly estimate the weather conditions. It is quite fun when you know that you can read clouds and their movements. Studying clouds is quite interesting mainly because they keep on changing their shape and you can spend unlimited hours in watching their formation. If you are interested in studying clouds for the sake of fun, there is a lot of material available on the internet regarding this topic. What are stratocumulus opacus clouds? The most common types of cloud which can be seen in almost all parts of the word are stratocumulus clouds. The word stratocumulus is a basically a Latin word that means heap of masses. They are usually seen in dark and large masses in the form of waves, lines or groups. 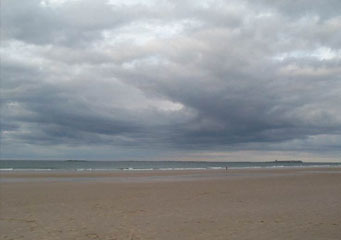 Stratocumulus opacus are a low level cloud and are a strong evidence of bad weather. Once you see them, you can expect heavy precipitation and sprinkle. Sometimes they are an indication of thunder showers or gusty winds. How are stratocumulus opacus clouds formed? When cold air is mixed with warm or hot air, the cold air will tend to move downwards as it is denser than the latter. This movement will give stratocumulus opacus the shape of layers or waves. In summer, these cloud-layers have some gaps in between through which the sun shines. There are times when they overcast the sky completely making it hard for the light to penetrate through. Most of the times, these clouds are thick and have unbroken layers that do create an effect of dramatic skyscapes. What height are stratocumulus opacus clouds found? On the whole, stratocumulus clouds are low level clouds that bring the news of drizzle or rain. The usual height of stratocumulus opacus cloud is lower than six thousand feet. They have an uneven shape with two close layers one above the other. You will get to see these clouds where there are rising air currents in the sky. What do stratocumulus opacus clouds look like? As mentioned earlier and just like the name suggests, stratocumulus opacus can be easily identified from its long unbroken layers. Although they cover the sky completely, the entire sheet of cloud does not have any regular pattern of layers. You can easily see different cloud bases in the sky. If they get so thick that you are not able to identify their bases then stratocumulus opacus has turned into altocumulus clouds. On the whole, stratocumulus clouds are not threatening but its presence means that bad weather is expected. How common are stratocumulus opacus clouds?